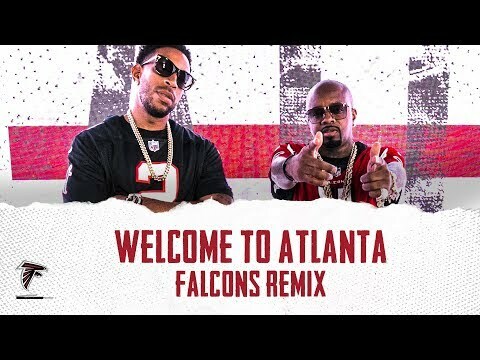 Jermaine Dupri and Ludacris reunite to repurpose their 2002 hit "Welcome to Atlanta" for the city's NFL team: the Atlanta Falcons. Released today (Sept. 5), the song features the two spitting bars about their home team and hyping up fans for the coming season. "Welcome to Atlanta, home of the dirty birds/Anybody that's hatin' can get kicked to the curb/Any other team is absurd/Wearing black, white, silver, red is for the blood/Ain't no one scared of getting dirty 'cause we came from the mud," Luda raps. Jermaine comes through with his verse, again interpolating his original verse with football references. "Welcome to Atlanta, where the Falcons play/And we goin' for that dub like every day/Big beats, hit streaks, see gangsters rolling/And parties don't stop till eight in the morning," he spits. As the two drop off their respective verses, they wear their own Atlanta Falcons jerseys, and of course, their chains. As they spit, video cuts in and out with shots of various players like Mohamed Sanu, images of the new Mercedes-Benz stadium, and videos of fans cheering. Both Luda and Jermaine can add this to their list of recent promos. Ludacris was featured in a new commercial for Harry's body wash in which he raps in the shower, and Jermaine Dupri partnered with PETA for a new campaign promoting his vegan lifestyle. The Falcons will kick off their season tomorrow evening (Sept. 6) against the Philadelphia Eagles. Check out the video of the "Welcome to Atlanta - Falcons Remix" below.